Having healthy treats on hand is the best way to stick to your food goals all day long. We keep healthy snacks in our purses or gym bags so that we have something light and delicious on hand when we’re feeling hungry. 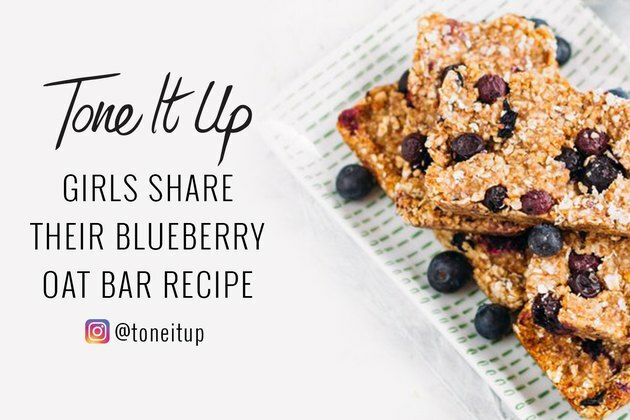 These energy-boosting, blueberry-filled bites are perfect for those on-the-go moments. Blueberries pack a serious punch when it comes to nutrition. They’re an excellent source of vitamin C, an antioxidant that may help to prevent or delay certain cancers. Plus, the fiber from the blueberries and oats in this recipe helps keep you full throughout the day. One blueberry oat bar provides 103 calories, three grams of fat, one gram of protein and 17 grams of carbohydrates. Prepare this tasty oat bar recipe for an easy snack you can reach for on busy days or before a workout. Want more healthy recipes to help you achieve your fitness goals? Join the Tone It Up Nutrition Plan. It’s packed with thousands of recipes, using ingredients that are scientifically proven to boost your metabolism and increase your energy levels. Will you be trying to make this blueberry oat bar recipe? What’s your favorite on-the-go healthy snack? Share in the comments section!